I've been neglectful this week, I apologize! But as I mentioned on Thursday, I have some fun stuff coming. Ah, a tutorial! On something you perhaps didn't care to learn anyway? Well, here it is. It is much less daunting to make a tutorial for part of something, or a technique, than it is to make one for an entire garment. So I went ahead and filmed this. There are pattern recommendations in the description bar below the video. I haven't actually looked at these in the store, so I don't know if they have facings or a lining, but they looked pretty decent. Let me know if you have a pattern in mind that would work for this, & I'll add it to the description! So that's that! If you have questions, I'd be happy to answer them. Excellent tutorial. Thank you so much. I know I'll be using this idea in the future. Thanks so much for making this tutorial. Super cute! Thanks for the tutorial, Addie! I "heart" this dress. Okay, okay, I know, bad pun... But anyway, I haven't gotten around to commenting on stuff. It's been busy lately, but I love this dress and I hope to use this tutorial sometime! Great tut Addie!!! I love doing this to the necklines of my dresses! Interfacing is best friend ever! The iron on is my fave choice! 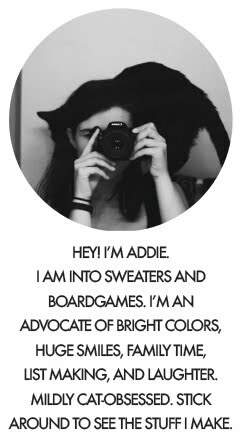 Thanks for sharing your skillz, Addie. ^_^ The Heart Cut-Out Dress is, by far, the cutest of your summer collection (at least from what I've seen). Hannah - Oh, don't worry about the commenting! I am always pretty bad about commenting, I understand. & I did laugh at your pun, haha. Tany - :) Thanks! Iron-on interfacing is magic, I swear! I'm french (so I'm sorry for my poor english) and I knew your blog via Burdastyle. I love what you sew, your ideas and your blog ! Anonymous - Interfacing is a material that is either ironed or sewn into places of a garment for structure, support, or stiffness.